Mike Philippov: Hi, this is Mike Philippov from PracticeGuitarNow.com and I'm on the phone today with guitarist Rusty Cooley, bringing you another interview on the best ways to practice guitar. Rusty is famous worldwide for his incredible guitar playing on both 7 and 8 string guitars. He also has a lot of experience teaching guitar, through live clinics and master classes such as the National Guitar Workshop in the US, as well as through many of his instructional DVDs that are distributed worldwide. In addition, Rusty has been a great source of inspiration for my own guitar playing through all the years that I was learning to play guitar and he has inspired me to push my guitar playing to higher and higher levels. So I'm very happy to have Rusty here today and I look forward to this interview very much. Rusty Cooley: Right on, thank you very much man, it’s a pleasure. MP: My first question for you is: How have your approaches to practicing guitar evolved over the years? What did you focus on when you were first learning to play guitar and how has your focus changed between then and now? RC: Well, I’ve been playing guitar for a very long time, so I'm not 100% sure on how I did it at the very, very beginning, but I know that when I started to get serious, it was all about the guitar practice schedules of course. Basically I would just sit down and divide my guitar practice schedules into different sections, such as if I was studying music theory, then it was 30 minutes of studying music theory, or working on rhythm guitar and developing song ideas and breaking it down into techniques such as sweep picking and alternate picking and hammer ons and pull offs and tapping. Also improvisation, building guitar solos and putting things together. When you are first getting going, in the early, early beginning, you are just stringing pentatonic licks together, so it’s not much of a guitar solo at that point. But through the practicing and doing it over and over again they actually turn more into guitar solos. One thing that I always did along the way was set goals. This way my guitar practicing has a point, aside from nailing different guitar techniques and things like that, my goals are: “by this certain date I'm going to have this accomplished”, such as being able to improvise over this set of chord changes or have a certain number of songs written. You have to have a plan of action, which is your guitar practice schedule, and then your goal. Your plan of action is how you are going to attain that goal. Putting it on paper and then committing to it is much more powerful than saying “Hmm, I want to have this done by this date.” Because that can just float. Nowadays my guitar practice schedule is more “event driven” (what am I doing now). Do I have a gig coming up? Do I have a session coming up? Do I have to film a DVD? Whatever the situation might be, that’s how I approach practicing guitar now. Nowadays it’s kind of hard for me to go sit in a room and practice arpeggios and alternate picking. I’ve been playing guitar for close to 27 years now, so it’s a little tough to go in and say “I'm going to practice arpeggios for 8 hours”. So, it’s very event driven - what am I doing now and what’s coming up. MP: Again going back to your younger years, can you talk a little bit about the guitar playing skills that you had the most trouble developing? What where the practice approaches that you used to finally master them? 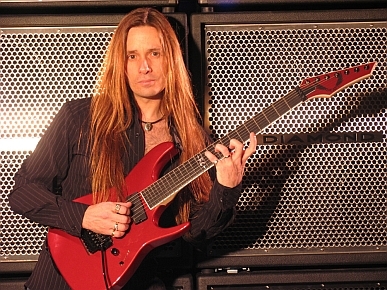 RC: I think probably the most difficult thing at first for me to master was sweep picking. With sweep picking, it’s not something you start working on right out of the gate, it’s something that you get to a certain point and then say “Okay, I'm ready for this now”. When I started playing guitar, nobody was sweep picking yet. It was Randy Rhoads and Eddie Van Halen, and the LA scene guitarists. It wasn’t until Yngwie (Malmsteen) came along that people started sweep picking. So I’ve been playing guitar for a good 3 years when I heard of Yngwie. At that point I had already a decent grasp on alternate picking and hammer ons and pull offs and basic 1 finger tapping. So jumping into sweep picking, there were no books, DVDs or information on it really, so everyone was kind of on their own. Thinking back, it probably took me a good 6-9 months to get one or two really good sweep arpeggios. And I remember practicing this stuff day in and day out and going: “Man, am I ever going to be able to use this stuff?” But, I was so in love with the way it sounded, that it was worth the wait. That was probably the most difficult thing at first, now it’s one of the easiest things to do, because I’ve been doing it for so long. I remember hearing Yngwie and going: “Man, if I ever figure out what that is, I'm going to do that all day”…and I eventually did. I’ll tell you one of the other guitar techniques that’s really difficult: I do a lot of tapping and developing the pinkie (on my tapping hand) is definitely one of the trickiest things to do. Now I never really applied myself to getting it down like I did with something like sweep picking, but it’s definitely a difficult path to get this down, so that’s been challenging as well. MP: My next question is about the subject of natural talent. Do you believe in this phenomenon, and if yes, do you believe that talent contributed to you becoming the great guitar player that you are today? RC: You know what, through all my years of playing guitar, I’ve never been a believer in naturals until I saw my son play the drums. That changed my whole perspective on people being naturals. I myself am not a natural - I don’t believe in it in any way, shape or form, because I know how many hours I’ve spent developing my guitar playing skills. My son, on the other hand, when he was about 14 I started taking him to the Outworld rehearsals during the summer, and he started getting on the drums when we were finished. And after about a week, we were all standing around wondering “who is in there playing drums?” And it was my son! So I thought: “it’s time to get him a drum kit.” And this kid, he can get on the drums after not playing them forever and just get on and go and not really have to apply himself, he just kind of picks it up and does whatever he wants. He actually changed my view on people being naturals - I guess there are, because he certainly isn’t working very hard at it. MP: What do you think was the single greatest attribute that contributed to you becoming the great guitar player that you are today? RC: Just the sheer burning desire to become a great guitar player and play guitar like my heroes. That’s it and nothing else - just completely driven. And the other thing that I think is a great deciding factor for a lot of musicians, no matter what instrument you play, is your ability to “love to practice (guitar)”. “Practicing” for most people is a bad word, and for me, half of the time I would rather be in there practicing guitar than playing guitar, because of what I was getting out of the practicing that was going to allow me to become a better guitar player. I enjoyed practicing scales and arpeggios and licks and techniques and improvising on guitar. I enjoyed that immensely. Whereas for most people, they just want the instant gratification of being able to play the songs by their favorite guitar players. So that’s it - I just WANTED it and want it still. Just that pure burning desire to be good and love to play guitar. I think that if you have that, you don’t need to have natural talent, because you will acquire the ability through your passion. If you want it, and you have that burning desire and you have the time and energy and focus to practice that amount of hours, I believe anyone can do it if you are willing and committed and have that kind of passion for it. It’s those who don’t who end up by the wayside. MP: My next question is about the topic of self discipline. Do you consider yourself to be a naturally self disciplined person? You already said that you sustained the motivation to practice guitar because you had the burning desire to become a great guitarist, but how did self discipline tie into that? RC: I don't really know where the discipline comes from. When I started playing guitar, it was like somebody flipped the switch on and I just immersed myself in it. I taught myself initially through Doug Marks’ Metal Method and Doug had great positive messages on practicing guitar and staying motivated and things like that. I took every word to heart and did it. For me it was never a matter of “you’ll never be this good” or “you can’t do this”, it was just a matter of “when” or “I can’t wait UNTIL”. It turned into other areas of my life as well. I am very much into weight training and the discipline from guitar just overlapped right into that, so I think anything you want to accomplish you can achieve with that type of mindset and discipline. MP: When you practice guitar, what do you think are the top 1-3 things that one absolutely must do in order to make the maximum progress possible from their guitar practice time? RC: Know what you are trying to attain. Because you can practice aimlessly and get nowhere. Practice things on guitar that are the most important to you right now. I can’t tell you what that is, everybody has to sit down and go “what do I need the most work in?” and “how can I spend my time the best to get the quickest, most effective results?” This is what each person has to decide and I can’t fully answer this question. Here is an example: when I'm first teaching guitar players the modes, I have guys who come in and want to practice them in all 12 keys. I personally think this is a waste of time. I would rather a student, at the beginning of learning the modes, really practice them in one key and try to obtain fretboard visualization and true mastery of that key. Now, I'm not saying “don’t play in other keys”, I'm saying “focus on one key to really acquire fretboard visualization”. Because if you really obtain fretboard visualization in any one key, then when you transfer that to other keys, it is going to be a mirror picture. If you work on one key in certain areas of the fretboard and then work on another key in another area of the fretboard, then you are going to have many gaps in your guitar playing. It’s a waste of time I think for a young guitar player to practice in all 12 keys. I think if you are metal guitar player you could spend your time more wisely than practicing guitar in all 12 keys. I am not saying that you don’t want to be fluent in all 12 keys, but I'm saying that there might be things that could get you quicker and better results, as opposed to spending time on things that you are not necessarily going to use right now. The way I developed my ability to play guitar in all 12 keys is kind of funny: I forced myself to write songs in other keys and then as I wrote in those keys, it forced me to develop my visualization in those keys. Also I’ve always tuned my guitar down a half step and that forced me to improvise in all the weird keys since I was always a half step off. So I’ve developed it through the years, but in the early days, if I spent 5 hours practicing guitar in all 12 keys and never used those other keys, then what was the point? It was only slowing me down from being more productive in other areas. Practice guitar with a goal in mind and eliminate the other things around you. Be very, very focused. MP: When you were younger and you were listening to your favorite guitar players, did you ever wonder things such as “Will I ever reach their level of guitar playing?” or “Will I ever be that good?”? Did you ever have moments when you doubted your potential to reach your guitar playing goals? RC: No, for me it never felt like something that I couldn’t attain, it’s always been a matter of “when” or “I can’t wait until”. That was always my mindset. I never thought that “I couldn’t” (reach my goals). It kind of frustrates me at times when I notice some guitar players who hear other great guitarists and then become discouraged and say “Oh man, I'm just going to throw my guitar out now”. For me, as a kid and even now, when I hear another great guitar player - that’s my motivation, that’s what makes me want to get in there and want to practice guitar harder. I welcome other great guitar players because I want to learn from them. So it’s never been a put off to hear another great guitar player. It just makes me work harder and realize that there are more things to learn. So, to answer the question: No, it has always for me been ‘I can’t wait until’ and I never felt that there was something that I couldn’t do. That’s also the way I feel now. If I decided tomorrow to be a jazz fingerstyle guitar player, it would just be a matter of time and commitment to the goal. I think anybody can attain anything they want musically if they are willing to give up the time and put in the work. MP: Switching gears now, let’s talk about musical creativity. What were the practicing approaches that you used in the past or that you use now to develop musical creativity and how do you practice to keep expanding on this skill? RC: Musical creativity comes through experimentation. Learning one chord or one new scale and just seeing the way you can get ideas out of it and expand on it. You’ve got to start digging in and searching and looking for things. I think one thing that helps me to be more creative easily is my knowledge of the guitar fretboard. The better you can see where all the notes are on the fretboard, the easier it is to pick out and find what you are looking for. I can see the notes on the fretboard, therefore I can put my fingers down in any combination and come up with any kind of chord and know that it is a “1 b3 5 b7 9”, or whatever it might be. So my knowledge of music theory and fretboard visualization allows creativity to be much simpler and that helps me a lot. I can’t imagine not knowing music theory. That would be like being dropped in the middle of nowhere in the middle of the night and being asked to find your way home. I'm sure that you can probably eventually get home, but having a map would make it a lot quicker. MP: When you were first learning to play guitar, did you have periods of time when your progress was slower than you would have liked it to be or where it maybe even stopped completely? Or was your progress basically happening at a consistent rate throughout your years of guitar playing? RC: I think all musicians go through ups and downs and what I like to call those moments are like “burnout”. The easiest way for me to overcome those sticking points is in two ways: One of the things that always keeps me going and motivated and inspired and helps me to continue to progress quicker is new music. If I reach the point where I feel like I'm stagnant in my progressing, I’ll try to find some new CDs. Because one cool new guitar riff by an artist can spark a whole new level of creativity in me. That’s one way to get myself out of that rut or slow moment. Another way is to buy a new instructional guitar book or DVD. Picking up one new guitar lick, one new chord or one new scale can spark a whole new level of intensity of guitar practicing and motivation and get you out of those slow points or ruts. So I'm very music driven. When I reach burnout in my CDs, I want to find something new to spark some more creativity. I feed off of other artists. And I’ve read interviews with other musicians who say that when they want to be creative, the last thing they want to do is listen to other people. For me that is what keeps me motivated and keeps me fresh. I never want to be one of those guitar players where I just keep putting out the same record over and over again. I always want to keep reinventing myself and keeping fresh instead of doing the same thing always. So those are the things that help me keep going. MP: When you were practicing, how did you go about measuring your musical progress with all the areas that you were working on? RC: In the early days, the best ways that I was able to measure my musical progress was by recording myself on a boom box on a cassette every 3-6 months. I would just turn on the tape and let it go for 15-20 minutes, date it and save it. In another 3-6 months, I would get the tape back out and do another session. Before you know it, the year is up and you can go back and listen to yourself play guitar every 3-6 months and say “Wow, I’ve really made some good improvement!” or “What the heck have I been doing this past year?” So in the early days it was measured by recordings of myself and by listening. I focused on picking out what WASN’T good instead of what “was” good. Obviously most guitar players know what they are good at, so when you listen back to the tape you have to be willing to say “Oh no that’s not so hot, I need to fix that or I need to fix this”. That’s even a great way to help your band progress. Record your band rehearsals and let everybody go home with a CD at the end of the night. If you are playing with a bunch of guys who are honest and open, they are going to know what needs work and nobody needs to say anything. Everybody comes back the next day with everything fixed. That can help your band as well. The best way to figure out where you are at is to listen or watch a video of yourself. Compare these recordings to earlier videos, note your progress and be honest about it. MP: Do you think that there is a particular guitar technique or musical skill that one needs to continuously work on regardless of how advanced they become as guitar players? Songwriting and improvisation. Improvising, if you are really truly improvising, is something you can always be better at. And songwriting is something that you can also always be better at. There are things that lead up to better improvisation and better songwriting. These things are what you are doing when you are practicing guitar and how you are approaching begin creative, having an open mind and willing to figure things out to another level. Also as guitar players, we must always stay on top of our guitar technique. If you let that slip, especially if you play extreme kind of guitar stuff, you are losing it most likely. If you are more of a classic rock or blues guitar player, you can let that slide a little bit. But not if you are on the more extreme end of things that involve a little bit more “athleticism”. You’ve got to stay in shape. MP: Okay, this about wraps up all my questions for today. Thanks very much Rusty for sharing your insights on practicing guitar. It's rare that a guitar player of your caliber takes the time to share all of his secrets and strategies for becoming a great musician, so I hope that everybody who listens to this interview really applies all the concepts that you talked about here today and benefits from them in the same way that you did. So thanks again Rusty and all the best to your future musical projects. RC: Awesome, thank you very much, it was my pleasure! Don't settle for mediocre guitar playing. Learn how to practice guitar correctly and watch your musical progress soar.